The disputed image is below. 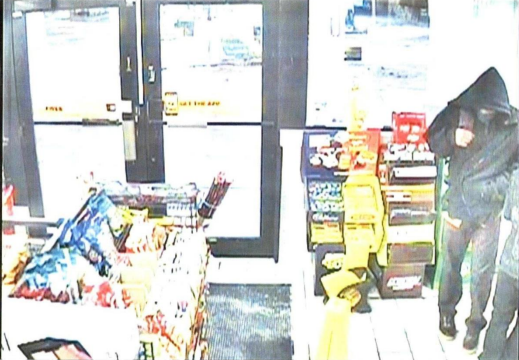 It’s of a similar robbery three days before the robbery for which Malone was convicted of felony murder (the other robber in that latter robbery–who testified against Malone–admitting shooting and killing the gas station clerk). The state showed the video of that earlier robbery to the jury, hoping to convince them that Malone did that one, and thus likely did the one he was being tried for, too. Showed it, that is, except for the 10 seconds including this frame, which seems to show a white person’s hand on the robber the state claimed was Malone. Malone is black. The jury that convicted Malone never saw that image. Malone argues his trial lawyer was ineffective for not either objecting to the state’s editing of the video, or simply playing it as part of the defense case. (He also argues that the earlier robbery wasn’t proper other-acts evidence; a proposition the court rejects in a fact-intensive discussion. Basically, the robberies were very similar (involving two of the same admitted participants), close together, and near in time). (¶¶32-46). The court of appeals concludes that even if Malone’s lawyer performed deficiently, Malone wasn’t prejudiced because there wasn’t a reasonable probability of a different result had he shown this part of the video, because the evidence against him was just too strong. (¶¶51-61). And in some ways, it was strong. Two admitted participants in both robberies (the aforementioned gunman and the getaway driver) testified Malone was their accomplice in both. Surveillance video from the apartment building where all three lived or spent time shows the the two other participants leaving shortly before and returning shortly after the time the charged robbery occurred, and they’re accompanied by a tall, bald-headed man–a description that fits Malone. That man was also wearing clothing of similar color to the clothing one robber wore at the charged robbery (there’s video of that one, too, but the perpetrator’s masks obscure their identities). The other robber’s sister said he had left with “the bald guy” to go to the store just before the robbery occurred. And, a blue surgical glove, like those the robbers appear to wear in the video, was found in the apartment where Malone sometimes stayed (which was across the hall from the apartment where one of the admitted accomplices lived). [W]hen the key apartment building entryway footage was captured at 11:00 p.m., [the two testifying accomplices] indisputably had just finished participating in the Citgo robbery approximately twenty minutes earlier. And Malone was now entering the apartment building with them. Quite simply, it is beyond difficult to believe Malone walked into the apartment building with [the accomplices] at that critical time just by chance. The only reasonable conclusion the jury could make was that Malone walked in with them at that time because he had just participated in the Citgo robbery with them, as Cotton and Thomas testified. Is it really “beyond difficult to believe” that one neighbor could encounter two others on the way into the building they shared? Has that ever happened to you? And that’s even accepting the assumption, in the above quote, that the tall bald man who “could” be black was Malone. Nevertheless, all in all, a fairly strong case for the state. But is it really so strong as to eliminate a “reasonable probability” that the jury could have had reasonable doubt, had it seen what appears to be a white person committing the earlier robbery the state said Malone committed? The State acknowledged in its other acts motion that unfair prejudice occurs when “the proffered evidence has a tendency to influence the outcome by improper means.” See State v. Sullivan, 216 Wis. 2d 768, 789-90, 576 N.W.2d 30 (1998). When the police removed the racial identity of the second robber, the State utilized improper means to influence the outcome. What can be more prejudicial than having exculpatory evidence as to identity withheld from a jury? It was the jury’s job to determine if the second robber was Malone based upon all the relevant facts placed before it. Not having the evidence from the raw surveillance video that the second robber was a “white guy,” the jury was without material exculpatory evidence. Setting blame aside, the criminal justice system failed and Malone is entitled to a new trial on the grounds of ineffective assistance of counsel as well as in the interest of justice.